Why limit your snorkeling experiences to the warm waters of the Caribbean or the coasts of Australia? 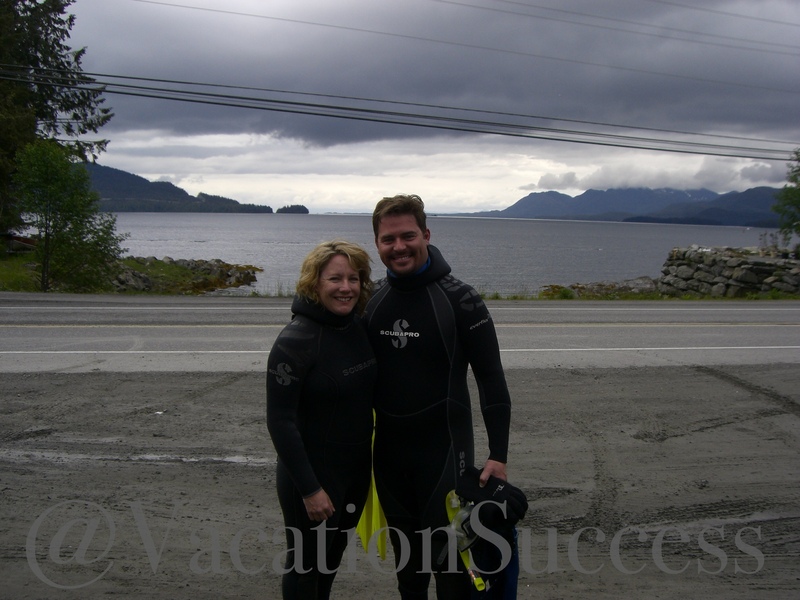 We snorkeled and cruised Alaska in 2011. We took in Ketchikan, Skagway, and Juneau, stopping for an evening in Victoria, BC. During our port stop in Ketchikan, we took full advantage of this adult-only vacation and snorkeled. The water was about 52 degrees. Enough to take your breath away when you jumped in the water. But, well worth the initial cold shock once we saw the beautiful wildlife waiting for us: salmon, crabs, starfish, sea urchins and ocean grasses. As you can imagine, this wasn’t the most popular of excursions for the ship-goers due to the more strenuous nature of the activity. So, we only had about a dozen people with us. That excursion was about $115, and three hours including the bus ride, suiting up, snorkeling and warming up after. Sailing Celebrity’s Infinity out of Seattle, our first stop was Ketchikan. (Now called the Celebrity Solstice, after it was refurbished in 2011) The ship hosts about 2100 passengers. From Ketchikan, we sailed into the Tracy Arm Fjord. That is a once-in-a-lifetime experience. Mother Nature is awesome, you’ve never seen the color blue you see in a glacier. Then on to Juneau, Skagway, the Inside Passage and Victoria. Keeping with our outdoorsy theme, in Juneau we went sea kayaking. One word – AMAZING. We saw the Mendenhall glacier, watched eagles dine on shellfish during the low tide beach, and, even had a cute sea lion swim alongside our kayak. Cost is about $110/person and takes a little less than four hours. You’ll have a little time left over to visit the Alaskan Brewing Company store, or do a little shopping. Unfortunately, in rainy Ketchikan, many of 2100 passengers joined us for the Great Alaskan Lumberjack Show. Cheap, as far as excursions go, $38. It was about an hour-long, leaving us time to shop near the port before heading back to the ship. Skagway, along with the other Alaskan ports, is really geared toward the cruise ships. We did the touristy things while there for the day. Our parents, who sailed with us, took the train up the mountain to explore the beginnings of the Klondike gold rush. Their pictures and stories would make us choose that option on our next trip. Cost for the train excursion is about $200/person. Its five hours round trip. I recommend you download the excursions brochure from the Celebrity’s website while you’re planning your trip. You can book excursions before you sail. Or, do like we did and take the path less traveled, selecting excursions that are more strenuous and less popular. If you do that, you can probably make your plans while on-board. As an example, here’s the 2014 Celebrity Cruises excursion brochure. Follow us on Twitter @VacationSuccess or follow our blog. Hi there, Hypnosis. Nice to hear from you and your partner. Vacation Success is always open to guest bloggers. If you have a story to share, we’d love to help you do so. Contact us at vacationsuccess@gmail.com. 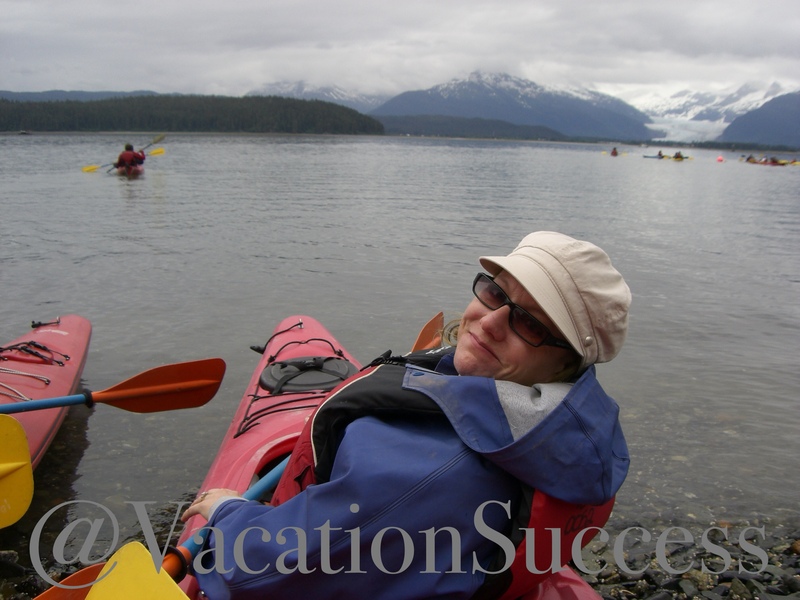 Thanks for finally writing about >Snorkeling Alaska | Vacation Success <Liked it! Alaska is amazing. Something everyone should see in their lifetime. Thanks for the comment.